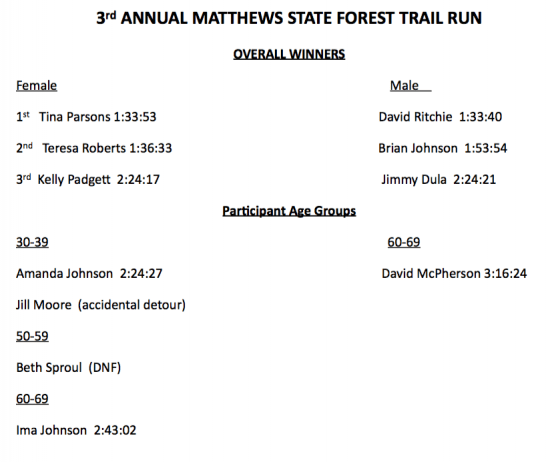 Masterpiece Fitness sponsored our 3rd Annual Matthews State Forest Trail Run Saturday morning, April 4, 2015. Loyal volunteers began arriving just after 9:00 to make our event possible. It was a chilly morning with blustery wind. However the trail was in great condition thanks to the local mountain bike riders who maintain the trail. Matthews State Forest cut a tree for us and sponsored the porta-potty to whom we were all grateful. Half of our runners were from out of town, one from Tennessee, and a group from Wilkesboro, NC. Participators and volunteers gave generous donations for the local mountain bikers, and for Matthew State Forest who receive no funding for recreation. We are grateful for an opportunity to express our appreciation to both groups. All agreed it is a challenging run, but everyone left happy with a great sense of accomplishment, and all were glad they did it with everyone planning to return next year with friends.